Thanksgiving is less than a week away! Many of us are heading to our grocery stores and stocking our kitchens with delicious ingredients in preparation. What a wonderful time to share recipes made with such love, and many times, love that is passed down from generation to generation. I wholeheartedly believe that home cooked meals carry a high vibrational and nutritional energy that cannot be recreated in our restaurants and fast food establishments. This energy transforms the way we process and digest the foods we eat, too -- in positive way! What a perfect time to enjoy these special meals, and most importantly, connect with those we love most while doing so. While all of this sounds amazing, many of us struggle with switching up our typical dietary routines, especially around the holidays. Those few minutes of pumpkin pie heaven can quickly turn into hours of negative self-talk and guilt. For some us, it can even turn into hours or days of stomach pains, skin issues, and fatigue. Believe me, I’m right there with you. I compiled a few tools and recipes to help you bust through the Thanksgiving food dilemma this year. Enjoy! 1. Always eat food that makes you feel good! If you know that filling your body with a ton of extra sugar from processed carbs and desserts is going to make you feel sick, you don’t have to do it! You never have to feel guilty about politely declining a dish on behalf of your health. If you struggle with blood sugar resistance, for example, that giant brownie may not be worth the energy crash and mood fluctuations that are soon to follow. And of course, if you have food allergies and food sensitivities that cause reactions/digestive distress, sticking to foods that nourish your body is key. A couple minutes of tastebud pleasure may not be worth feeling awful later. When you focus your thoughts on how you want to feel as opposed to how bad you want a specific piece of food, it helps put things into perspective. Talia Pollock, from Party in my Plants, dishes out some awesome advice around this topic in the newest episode of the Wine and Shine Podcast, “Take the Hell out of Healthy.” I highly recommend this episode to get you pumped for eating healthy during this holiday season! 2. Bring delicious and healthy dishes to share! If you’re not sure if your family’s Thanksgiving will accommodate your diet, it is time to start cooking! Plan to bring at least one dish that you know will fill you up as your main course. Even better, your family will get a chance to try your healthy recipe as well! Not too confident in your cooking skills? You’re preaching to the choir, here ;) If you don’t feel comfortable making a dish to share, there are a number of easy and filling items you can grab in a pinch to supplement your meal. Last year, I totally forgot to food prep in time. So, I headed over to the grocery store and purchased a sweet potato and some veggies. I cooked these up real quick and enjoyed them as my side dishes! You can typically count on some turkey or ham (if you eat meat) as your main dish. If you’re vegan or vegetarian, plan to bring a protein packed pot of chili or soup and then stock up on all the veggies that your family brings. You totally have options! And for the love of chocolate… bring your own healthy dessert! You will inevitably find yourself drooling over the pies and cookies, which in turn, will cause you to feel restricted and tempted to binge. Prepare ahead of time and bring your favorite healthy dessert to share! Not only will you satisfy your sweet tooth, but your family is sure to enjoy as well. You can tell them it’s “healthy” afterwards and watch their astonishment ;) If you run out of time to bake a dessert, grab a bag of enjoy chocolate chips and some almond butter and you’re all set. Choosing to eat food that nourishes your body and keep you energized might take a bit of planning, but it is worth every minute. Get creative this year! 3. Above all else -- OWN what you choose to eat and ENJOY every single bite. Let’s be real, it isn’t often that you get to dive into a piece of your grandma’s out of this world pumpkin pie. So, let yourself off the hook a little and ENJOY IT (if your body tolerates the ingredients of course!). Remember, there is something special to food made with such generational love. It feeds our body (and our soul) in a different way. When we choose to reframe our thought process, we can learn to honor each bite, knowing that we served our body from a place of love and connection. This is a practice I am continually working on in regards to my relationship to food. Although I understand that gluten and dairy don’t make me feel the best -- I also understand that indulging once in awhile isn’t going to cause my body to explode into a million pieces. It also doesn’t mean that I have somehow “cheated” or have “lost control” of my typical dietary routine. Rather, it means that I am trusting my body and honoring my intuitive cravings! If I choose do branch out of the typical routine, you better believe that I am going to enjoy every. single. bite. Remember, you can enjoy your piece of pie and your organic turkey and sweet potato, too ;) Practicing gratitude for ALL food, and your ability to choose based on what your body needs at the time, is a beautiful thing! Looking for some thanksgiving INSPIRATION?! Try out these recipes from a few of my favorite food bloggers and recipe developers! I can't wait to experiment in the kitchen and dive into these yummy dishes! This casserole looks incredible. What is a Thanksgiving dinner with out some sweet potato love?! I love following @hummusapien for her tasty recipes, and of course, her Columbus pride! If you haven't checked out Alchemy Juice Bar or TRISM - you're missing out! Fall is the perfect time to cozy up with some soothing soup. I can't wait to try out this recipe developed by my good friend @eatwelldetroit. What a perfect side dish this Thanksgiving. Her blog is full of yummy and healthy eats, a must read! Ok, seriously. You cannot enjoy a Thanksgiving meal without some stuffing!! I am DYING to try this. Cassy Joy from @fedandfit creates so many wonderful paleo-friendly recipes, this one is sure to hit the spot. Last but not least, dessert! 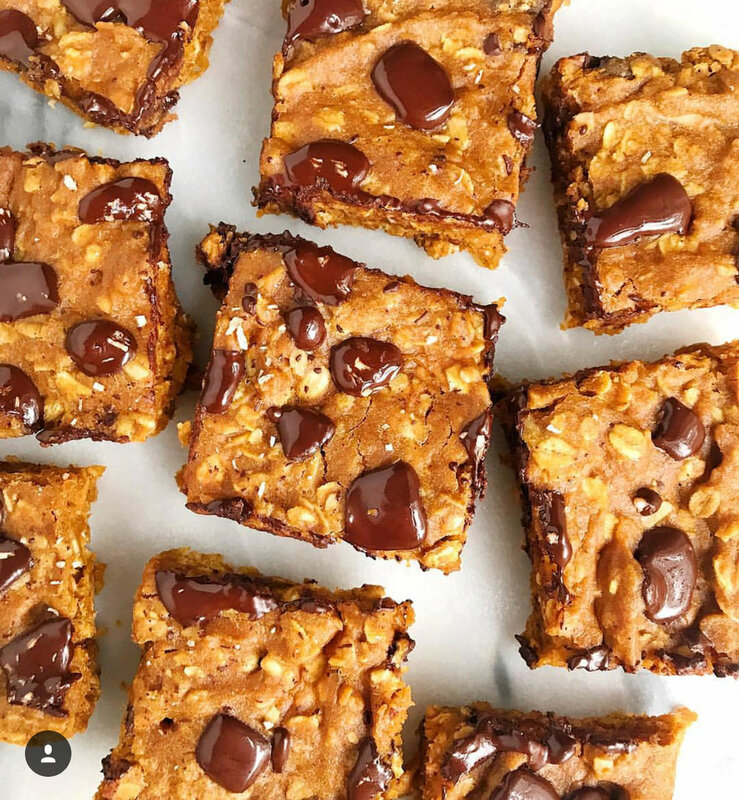 @rachlmansfield creates a TON of gluten-free & dairy-free baked goodies. These pumpkin bars look like the perfect to end a delicious Thanksgiving meal. Here is to a deliciously happy and healthy Thanksgiving, friends! I hope you all enjoy this season of love, connection, and yummy eats. Want to receive these blogs straight to your inbox? Sign up HERE at the bottom of the page!